Bajaj Allianz Life Insurance is a joint venture between Bajaj Finserv Limited and Allianz SE, leveraging a fine blend of global expertise and local experience. With a comprehensive and innovative solutions portfolio that combines the technical expertise and experience of Allianz SE, and the in-depth market knowledge and goodwill of the ‘Bajaj’ brand in India – Bajaj Allianz Life Insurance has earned customer trust and market leadership in a very short time. Webenza is a leading Digital Marketing firm, based out of Bangalore with a varied clientele in India and around the world. With expertise across all aspects of Digital Marketing, Social Media Campaigns, Technology, Social Listening & Analytics – Webenza offers a wide array of solutions to clients – spanning Brand Awareness, Community Building, ORM and Lead Generation. Webenza, founded in May 2012 by Puneet Pahuja, a veteran with over 20 years of Global professional experience in the Technology and Analytics domains, today has a team of 60 professionals. The organization has engaged with over 100+ clients (including 40+ retainer clients currently). Create awareness and educate people on different ways to save Income tax through Life Insurance schemes, under Sec 80C using Social and Digital mediums. Insurance in India is sold primarily through channel sales, where multiple advisors typically use financial jargon to communicate with the consumer. Those who don’t understand the benefits of Life Insurance, but want to invest in tax saving instruments, fail to connect with these advisors and hence lose out on such investment opportunities. The communication strategy around Social and Digital mediums was to leverage popular culture – to connect with the target audience. The central theme of the campaign was inspired by the quintessential Bollywood villain, a character called the ‘Tax Monster’, which is a personification of the much-hated taxes. This character communicated with the audience in a typical cinema lingo – peppered with a liberal mix of humor and the legendary dialogues of famous villains. The campaign focused around common Tax issues faced by working professionals/individuals. A lot of the communication focused around issues related to investment and healthy investment options. 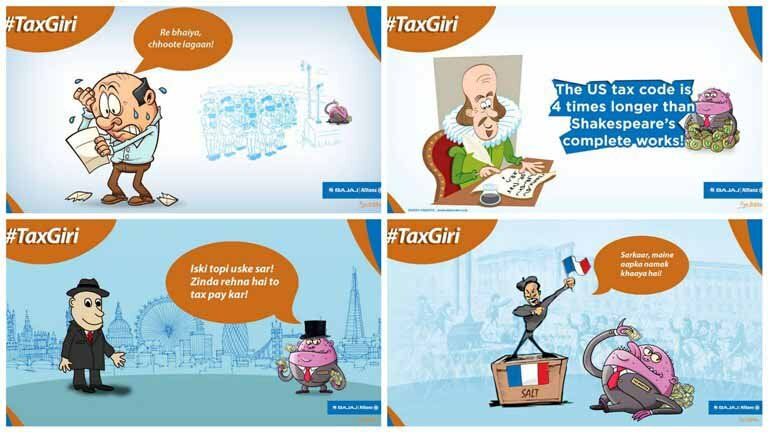 The #TaxGiri series was used as a vital content bucket to communicate tax trivia and tips with the target audience. A micro-campaign #PictureAbhiBaakiHai encouraged users to come up with smart ideas to overcome real-life like situations put up by the brand. An informative video was created highlighting different ways of defeating the ‘Tax Monster’. Special days during from January to March, and events such as The ICC World Cup series, were utilized with quirky #tags, to drive engagement and showcase the fun/human side of the brand – #WorryFreeMoment, #BefikarMoment, #MaukaPeChauka Moment, Valentine’s Day – #ValenTaxDay, Women’s Day – #HERoInMyLife and Holi – #KheloHoliBefikar. 68,920 new fans on Facebook & 14,384 new followers on Twitter. 227,382 users engaged with the brand creating a whopping 673,996 impressions across social media channels. #TaxMonster and #PictureAbhiBaakiHai had 2,413 & 5,471 mentions across social channels. 3,938 enthusiastic players shot the Tax Monster. 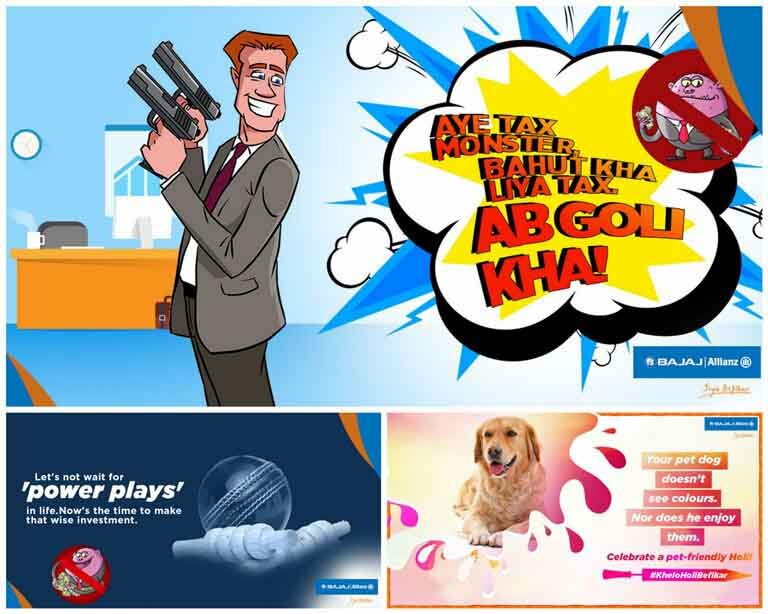 #PictureAbhiBaakiHai was well received with 300K+ impressions and Defeat the Tax Monster Interactive Game improved engagement for the campaign with 3.9K participants in 48 hours and up to 10% of them converted into leads, proving social & digital when integrated can generate real business benefits. Regular content pieces (Insurance related) when clubbed with current happenings (Valentines’ Day, Union Budget or Cricket World Cup) garnered the best results. Digital assets like Tax Calculator and product tabs turned out to be most visited and a useful property for our audience.